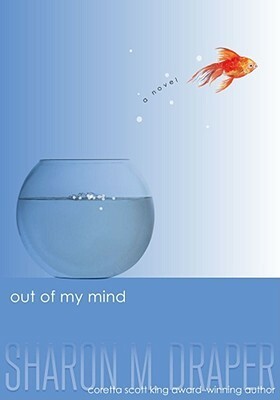 I've heard and read nothing but fabulous reviews of Sharon Draper's Out of My Mind. I had the book on my to be read pile for quite sometime but didn't get an opportunity to read it now because it has been placed on Illinois' reader's choice award lists. I'm so glad that I finally sat down and read it because it was absolutely marvelous! Description: Melody is not like most people. She cannot walk or talk, but she has a photographic memory; she can remember every detail of everything she has ever experienced. She is smarter than most of the adults who try to diagnose her, and smarter than her classmates in her integrated classroom- the very same classmates who dismiss her as mentally challenged because she cannot tell them otherwise. But Melody refuses to be defined by cerebral palsy. And she's determined to let everyone know it...somehow. Unlike the person in the song, which ambiguously doesn't identify the monster, Melody doesn't need sympathy or pity, but starves for normalcy and a chance to showcase her intelligence. When inclusion classrooms are introduced in her school, Melody's heart bursts with hope. She gets a chance to interact with children other than those in her special-needs unit. While we would like to see Melody be embraced by her classmates, Melody is the unspoken "other," and they are mostly uncomfortable with her sounds and jerky movements. Like every child growing up, normal problems of school friendships are present, but magnified, which isn't to say that they are overly dramatic but acute because it targets, punctures, and wounds us at our most sensitive and intimate part of ourselves. There were many times throughout the book where my heart would break, leave me teary eyed, guilty and embarrassed of things that I've known to do. I appreciate Draper to not sugar coat the difficulties that Melody and her family face. Out of My Mind isn't a Disney movie where there are fireworks and everyone realizes their mistakes, apologizes, and ends with a song from a Top 40er who croons about overcoming adversity. Descriptions of both Melody's challenges, which we perform without a second thought such as going to the bathroom, putting on clothes, and the insensitivity of some are poignant, honest, and real. Yes, there are moments where I pumped my fist in the air in a congratulatory manner, but like life there are also disappointments and heartbreak. All of the characters, from the main cast to the secondary roles are realized and fully developed. I admire Melody and I hope I can be as strong as her resilient spirit. Rich in detail and eye opening experience of recognizing the essential normalcy and the difficulties of a young person with cerebral palsy, Out of My Mind is a must read for all ages and would be a wonderful book discussion. I can't recommend it enough and I honestly think my five star rating, which I don't give out easily, is not enough for this book. If you like this book try: Anything But Typical by Nora Baskins, and for a grittier read try Terry Trueman's Stuck in Neutral. Wow. This sounds like such an amazing story Rummanah, and this is a beautiful review! It's amazing how often I take small things getting dressed or going to the bathroom without assistance for granted, I can't imagine having to think and plan and ask for help with those things. Definitely adding this to my list! This sounds like such a good read. I recently reviewed Wonder and it broke my heart, made me smile and made me see things differently. This I am sure would do the same. I will definitely pick this up. Love the cover, so different. This sounds like an amazing book, Rummanah, and I'll definitely be adding it to my wishlist. I love stories that are portrayed from the perspective of people who are different whether physically or mentally because I think you can learn a lot from them and appreciate your life a little more. We always wish for more and sometimes you forget how blessed you are. What a beautiful review! Rummanah, I think all of us have made mistakes when it comes to interacting with those who are physically challenged. This novel sounds like a beautiful novel about what it's like to be that way. Little things we don't even think about. I am definitely putting this on my list. Thanks for the review. I don't know if I could handle a read like this, if for any other reason that the fact that it refuses to bend to what most would hope to see, instead of the actual truth of Melody's plight, but it definitely sounds worth it.